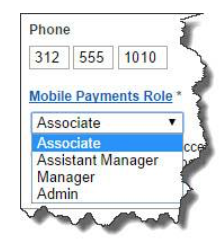 IF YOU HAVE ANY OPPORTUNITIES TO MAKE REMOTE SALES, YOU NEED TO MAKE SURE YOU’RE ABLE TO ACCEPT PAYMENTS ON YOUR MOBILE DEVICES. OTHERWISE, YOU’RE LOSING MONEY. Did you know that QuickBooks Payments which is integrated with QuickBooks Online or QuickBooks Desktop editions, now includes a FREE GoPayment account so that you can ring up sales away from your office? 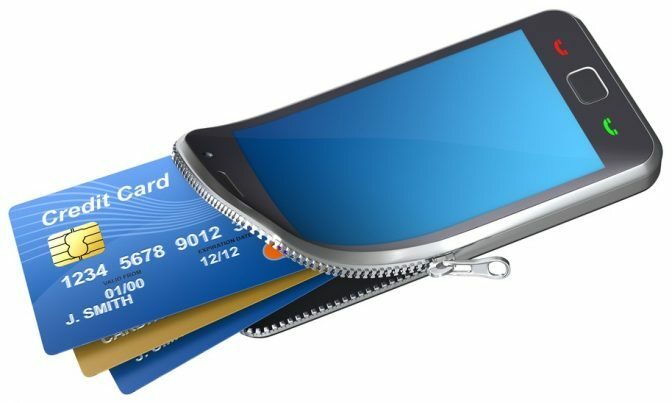 You’ve probably seen mobile credit card swipe devices at art fairs, trade shows, or other group gatherings: connected to smartphones or tablets. As accessibility and influential reach across the world become easier across all demographics, so do our capabilities to conduct business, which is why it is imperative to have the right mobile technology essential to business growth. Intuit offers a mobile processing payment service with GoPayment, and the new Bluetooth readers are EMV compliant. If the card has a chip, you can dip it into the device. You also have several options for a form of payment if you are unable to connect the device, you can scan the card, key it in, or accept cash or check. Your mobile employees can seal the deal, collect the payment, and issue a sales receipt — wherever they are. GoPayment data can then be downloaded into QuickBooks. When used with QuickBooks Point of Sale, you can even synchronize with your inventory on the fly! 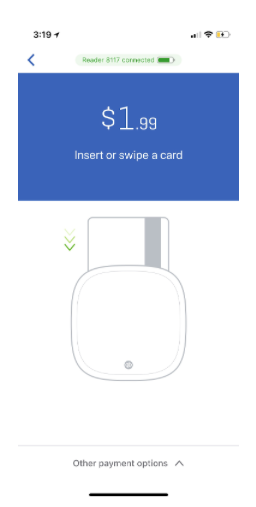 Figure 1: Intuit will supply you with a free GoPayment card reader when you sign up for the service. Request one here. The first step is to sign up for a QuickBooks Payments account, which you can do here. Two pricing plans are available, one for frequent users and another for the occasional mobile sale. If you do not have QuickBooks then you can sign up for GoPayment stand alone, you can learn more here. Please note: our rates are discounted from ordering in the product. Once you’ve submitted your application and are approved, you will receive an approval email from Intuit. You’ll create a password and download the app (both iOS and Android devices are supported). Next up: sign into the Merchant Service Center, a website designed to help you manage your Intuit merchant accounts. If you already have a merchant account that lets you accept debit and credit cards through QuickBooks, you’ve probably been to this site. 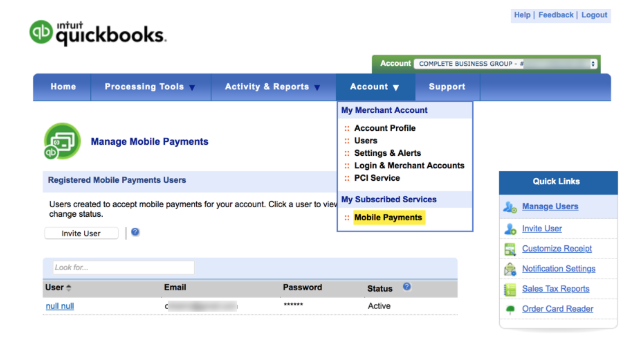 If so, open the Account menu in the Merchant Service Center and select Mobile Payments under My Subscribed Services. You’ll see your name and login information in the list of users, and you’ll be able to add other authorized users by clicking Invite Users. Each can be assigned a different access level, with varying levels of activity permissions. Figure 2: When you have multiple users in your GoPayment account, it’s a good idea to assign roles to them, which limits the activities they can perform. The Merchant Service Center contains a variety of online tools that let you, for example, enter credit card transactions, create recurring payments, and run reports. Those are relatively simple, straightforward actions. It’s also capable, of more sophisticated functions, like reversing transactions. If you’ve never had a merchant account, it’s critical that you let us introduce you to this tool. You’ll be dealing directly with financial institutions that have a variety of fees, regulations, posting deadlines, etc., and you need to understand all of the rules thoroughly. Managing the Merchant Service Center is probably the most challenging task related to GoPayment. Once you’re set up on your smartphone or tablet (go to Settings to customize receipts, enter item information, specify card reader type, etc. ), transaction processing should be fairly simple. Click Take Payment to get to the transaction screen, if you’re not already there. Either swipe or scan the card (or enter the customer’s card information manually), have him or her sign right on the screen with a finger or stylus, and wait as the card processes. Once a transaction is authorized, you’ll see a receipt on the screen that can be emailed to the customer. That’s it. Your sale is complete, and you’ll be able to download it into QuickBooks. GoPayment was built to be easy — and fast — to use, so you don’t leave customers waiting for a long time. We want to see you increase your sales and maintain a complete, accurate QuickBooks company file. Any questions? Learn more about QuickBooks Payments here. Ready to apply? Go here.